In the 19th century, lighthouse construction helped Great Lakes shipping flourish. Because major roads in Detroit had yet to built, the movement of freight was concentrated on waterways. 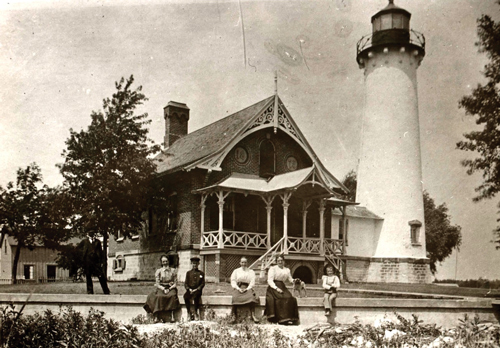 The Windmill Point Lighthouse opened in 1875, roughly where Alter Road meets the Detroit River, replacing the original 1838 structure. To map the United States’ new lands from the recent war with Mexico, Capt. Lorenzo Sitgreaves set out on a harrowing expedition in 1851. With 50 soldiers, Sitgreaves headed west from New Mexico. By the time the party reached San Diego, they had lost one soldier to an Indian attack and eaten all their own mules to avoid starving. Late the next year, Sitgreaves, part of the U.S. Army’s Corps of Topographical Engineers, arrived in Detroit. Upheaval at the Treasury Department, which oversaw the nation’s lighthouses, resulted in fresh administrative practices. The new Lighthouse Board wanted Sitgreaves’ engineering ability in the 11th District (Detroit). He would oversee construction and maintenance throughout the upper Great Lakes. In his four years in the region, Sitgreaves pushed modernization. The board wanted to adopt Fresnel lenses in existing lighthouses and expand other new navigational aids. And with the Soo Locks opening in 1855, the shipping of grain, lumber, and ore would increase. The efficient service Sitgreaves developed grew to impressive scope. Annual reports submitted to the Treasury Department show a complex, well-functioning organization, and it was making incremental improvements from the Detroit River to southern Lake Superior. In 1882, for example, Congress appropriated the first $20,000 for a new lighthouse and steam-driven fog signal at Bar Point, the tricky shoal where vessels entered or exited Lake Erie. Russel Wheel and Foundry Co. in Detroit made the cast-iron tower with a low bid of $7,450. Every spring, 11th District crews replaced navigational aids and repaired damage from ice flows. Of great concern in 1898 was Grosse Pointe light-vessel No. 10, a floating wooden beacon built 20 years earlier. “She was taken from her station at the close of navigation, Dec. 19, 1897, and laid up at the lighthouse depot at Detroit,” the report noted. The depot, equipped with a machine shop, saw workers repair all of the beacon’s burners, re-silver eight reflectors, and replace any rotting wood. The same district report counted 217 lighthouses and post lights, along with 377 buoys. Among the fog signals, 30 were operated by steam and five by clockwork mechanisms. To tend these installations — delivering construction materials, coal for fuel, and crews to make improvements — the district had two vessels. The Amaranth, a 744-ton steamer, was six years old. In the reporting year, she delivered 1,520 tons of material, steamed 10,099 miles, and consumed 865 tons of coal. Meanwhile, the Marigold, an eight-year-old steamer, covered 16,275 miles and consumed 860 tons of coal. She was docked at each season’s end for new paint and an overhaul of the stern bearing and outboard underwater valves. Less than a decade later, the 276-ton Aspen had been built, while the 900-ton Anemone, for use on Lake Superior, was under construction. The latter featured a 50-foot deck to accommodate acetylene buoys then being tested by the board. All modern appliances, including electric lights and a searchlight, were to be fitted. Sometimes Congress was mulish, though, in appropriating funds. It took a while to get $15,000 for a light vessel at Martin Reef, even as “the commerce passing from the mouth of the St. Mary’s River through the Straits of Mackinac has increased with rapidity,” a later report noted. The Lighthouse Board showed how much a nonpolitical federal agency could do to expand commerce. Professionals like Sitgreaves helped Detroit and the Great Lakes flourish. Tourists retracing Old Route 66 in western Arizona might pause in Sitgreaves Pass, which summits the Black Mountains at 3,586 feet, and remember his contributions.